Colin Campbell, Copywriter - Clear plain explanations. Click image to see the full list. It’s been a couple of months since I moved to Santa Barbara and I’ve been contacting the local web designers to offer my copywriting services. I’ve identified 79 local web design shops. You can see my full list here. 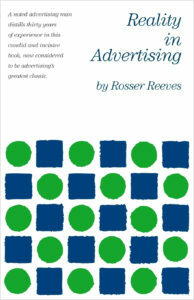 Reeves believed the purpose of advertising is to sell. He insisted that an advertisement should show off the value or unique selling proposition, (or USP) of a product, not the cleverness or humor of a copywriter. Reeves pointed out that to work, advertising had to be honest. He insisted that no amount of advertising could move inferior goods. In a previous era of my career, my freelance copywriting assignments came from ad agencies and graphic design shops. Now, they’ve been replaced by web-design shops. I’ve been searching the websites of local web shops, hundreds of them, and I see that few of them mention copywriting, and even fewer list a copywriter on staff. Their sites are devoted to their skills as designers and coders. When I ask them about copywriting, they shrug and tell me they use what the client supplies. The closest they get to it is to upsell some SEO—search engine optimization—to ensure essential keywords are included in the text. As a copywriter, I follow the basics from copywriter Rosser Reeves’ book, REALITY IN ADVERTISING. His idea was to study a company and discover what their unique sales proposition was: the essential thing that made them different from the competition, and superior to them. You can’t do it by just saying “We’re Different!” This requires the reader to instantly ascertain which aspect of the infinite universe you are different from. In my theory, I write copy that simply show what you are. Let the cognoscenti judge for themselves if you are different or not. 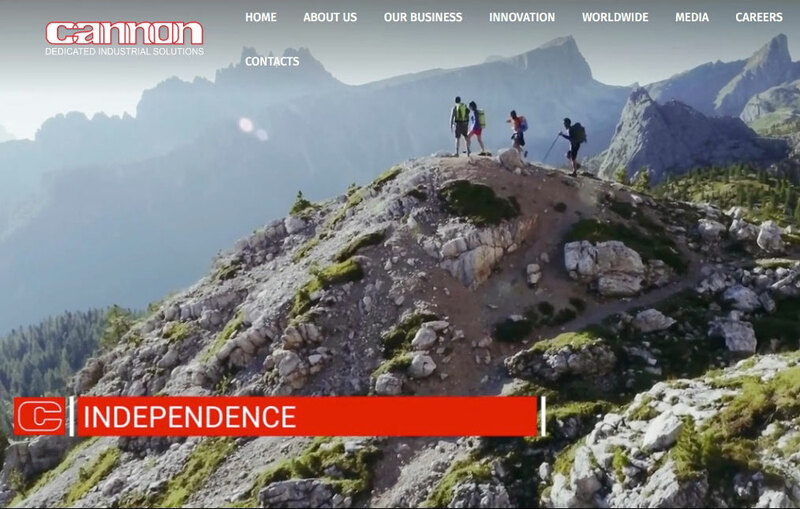 My theory is that a site that paints a clean plain picture of what the company does, is something that will stand out from the crowd of self-promoters gushing that they are the best in the world. My writing career began here long ago–I was on the masthead as Associate Editor for Issue #3 of Santa Barbara Magazine. I spent a couple years writing Dodge commercials for BBDO Detroit, then returned to Santa Barbara as a freelance copywriter in the 1980s. Then I left town to go to the Bay Area for the dot.com boom. Now I’m back, semi-retired and looking for freelance opportunities. What’s the first thing about your company that you want people to know? Some companies have never articulated what it is they are offering. They have no elevator pitch. Their site assures us they are the best and that they deliver optimal solutions. They proclaim that they are different from the other guys. They assume you have at the forefront of your mind every known fact about the other guys. They boast about what they are not, instead of what they are. I start out by knowing nothing about your company–just like most people who are not already your customers. I study your existing information and interview your people who you think should have input. Then I present a rough draft. Often I make errors because I don’t know enough about you: this is the process by which I remove the impurities. I move the best information toward the front, to where it can be seen first by potential customers. I call my process “zone refining” after a method of purifying metals by causing a narrow molten zone to travel slowly along a solid rod to one end, where impurities become concentrated. Lop off the end with the impurities and do it again. I take all the existing information about your company and put it in the cauldron and start distilling it. I exam each datum and decide whether it is more important or less important, and shove the less important ones to the back. I add more information as the client inspects and comments upon my iterative drafts. And then you have a fresh, clean explanation of your company. What a copywriter adds when you’re advertising your technology. Graphics folks and coders are typically indifferent to the substance of the text they are manipulating. They are highly focused on the look and the functioning of your site. They accept whatever text their technology clients provide. I recently looked at the websites of a couple hundred web design shops on California’s Central Coast. Virtually none of them have a copywriter on staff. My father was a typographer and I grew up in close intimacy with the presentation of text. He said that legibility is the most important element of any typeface. Each letter in a word must work with all the other letters, resulting in a clean, harmonious design across the page. I grew up thinking of myself as the intermediary between the information and the lettering. My goal was not to plaster the world with my ideas and opinions, but to channel the flow of information from a client and make it clear and understandable. One problem with front-edge technology companies is that they don’t want to explain themselves to a wider audience. They want to show off in front of the competition. They throw down a gauntlet and sneer, “Keep up with us if you can!” If you are not already fully aware of the deepness of their technological importance, they don’t want to talk to you. Some of it is their concern with security. It can be jarring to come out of a secretive lab environment and be told to blab it all to the world. Years ago, I was called in as a freelancer to write a full-page ad for an aerospace company to announce their new flapper nozzle product. The division manager was shocked that I didn’t know what a flapper nozzle was. He treated me and my questions as though I were an enemy spy, at first. Some stupid marketing writer that the bosses had imposed upon him. 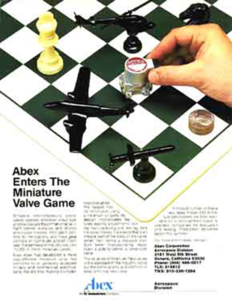 Click picture to read full text of this ad. Then, after he realized I was interested in learning about his product, he relaxed and told me about the creation of the device and its competitive advantage in the current marketplace of the hydraulic valve industry. It turned out that these flapper nozzles were used in helicopters and private jets and cruise missiles, so I gave the ad agency a sketch of how to make these the graphic focus of the ad. My ignorance is my tool. My theory is that most people know as little about your company as I do. I report my surprise and delight at your expertise, and make your expertise easy to understand. If it’s readable, it will work better. For technical products, should advertising text be readable? Hardly anybody ever reads advertising copy, even if it is the very best. So why go to the effort of making it readable? 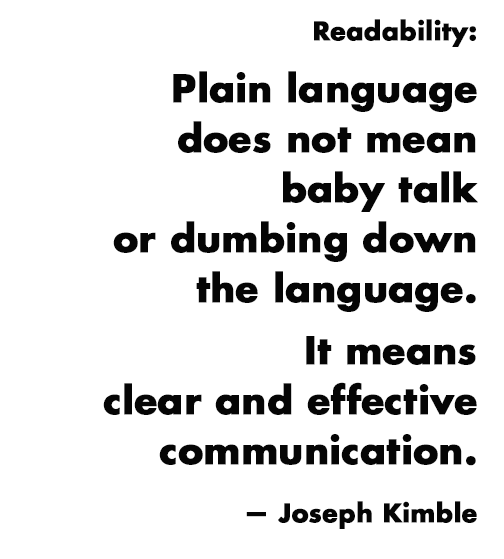 Some people think the idea of “readability” is a concession to morons, a dumbing down, an insult to the seriousness of their corporate intentions. In baseball they tell you, “Swing hard in case you hit it.” I make it readable just in case somebody besides a ‘bot actually tries to read it. Readable text makes it easy for visitors to quickly understand what your site is offering. If your technical product has an advantage over the competition, the best way to market it is with a clear explanation in plain language. Everybody prefers clear explanations. I start with an attitude of throwing the company wide open for inspection, of making an effort to explain the company rather than expecting the outside world to make the effort. I give you a fresh look, a clear window into the company that invites response. I can make any company interesting to an outsider. Why do I think I’m qualified to do technical copywriting. I’ve done a lot of it in the past, but I’m an adbiz guy, not a technical writer. I know how to separate out the boilerplate and chaff from a company’s literature and pare it down to the red meat of their story. What I want to do is to write brochure sites for technology companies who want to let the world know what they are doing. I’ve been studying science and technology all my life. I never completed my engineering degree, but I’ve been able to talk to engineers and translate their achievements into text that anybody can understand. I do it by being wrong about everything and letting the engineers show me where I was wrong, until I get it right. My niche is not a certain category of companies. I see technical and industrial companies that are not explaining themselves well, companies that have a market advantage that the market is not seeing. Companies that have a new product that they want to distinguish from what the competition is offering. New companies with a breakthrough product. I see them not only not explaining themselves well, but not explaining themselves at all. As an outsider to their industry, I see that they are using the same word structures as other industries to make a generic façade of self-approval. They aren’t talking about what they actually do, they’re talking about industry norms in very abstract terms. So when they have a new product or a new method, they are unable to see it as an outsider might see it. I can’t talk to anybody in any field without them telling me how technology has transformed their field. But they are so busy with their own field that they haven’t noticed the transformations in the next guy’s field. People think the changes in their own field are normal and well known. I create a plain explanation to give potential customers a clear view of what you are offering in concrete terms, in active language, in context with the onrush of technology in your field. My creative goal is to learn what the engineers have accomplished and write it down clearly. My process is: rewriting. I interview the subject matter experts and get suggestions for further reading. I write a draft and show it to the engineers, and they laugh and point out my blunders. I rewrite it with my new understanding, and this time my errors are more subtle, but the engineers still find them. Then I present a draft that they admit is a clear true explanation. And from there we devise a plan to market this explanation. I was researching something else and came across these two tech companies with diametrically opposed menubars. One is so completely generic that you cannot get the slightest glimmer of what it is that they do. Sangfor presents zero information about themselves in the menubar. It’s up to the visitor to want to press in further to find out if this is the kind of company they’re looking for. These guys let you know a lot about themselves from the get-go. They are not wasting your time with generics. My hobbyhorse is: information transfer. Every aspect of a page should transfer knowledge about the client into the visitor’s brain as fast and easy as possible. Some companies say, Oh, we’re so huge and multifarious, we do so many things, we can’t be fairly represented by any one item. 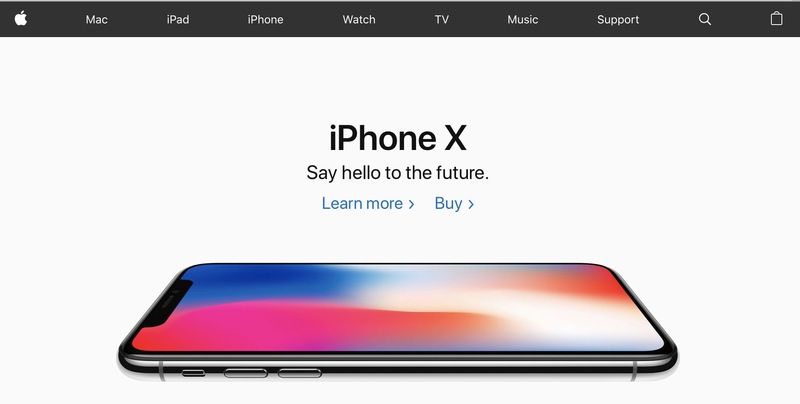 But if you look at the landing page of the biggest company in the world, they’re able to cram every product line into their menubar. Cannon has been providing Reliable Responsive Solutions to clients since 1976. 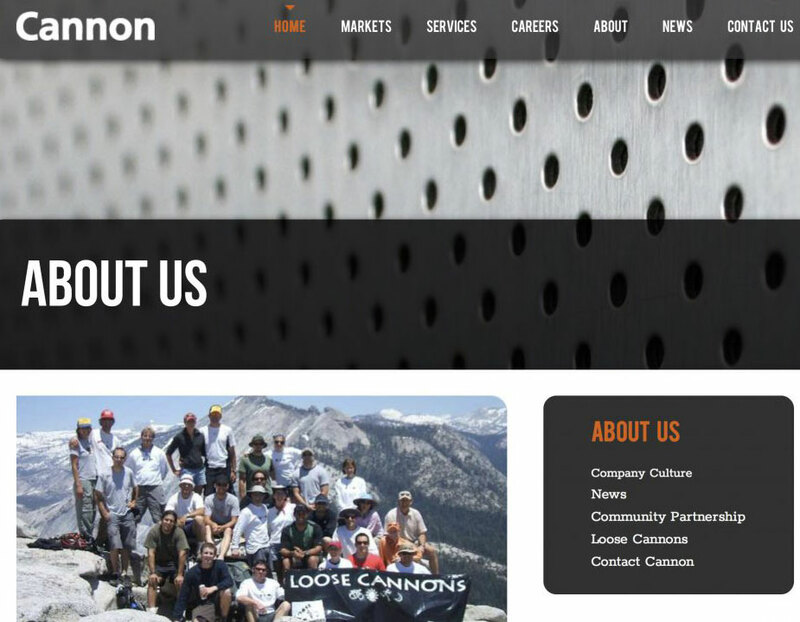 Cannon has earned a reputation for excellence, skillful organization, efficiency, precision, and innovative design solutions. Quiz: which of these Cannon companies does this apply to? I keep seeing sites of companies who feel they don’t have to explain themselves. I looked into it because maybe they wanted technical copywriting for a marketing campaign. Also, the company is located just a few miles up the freeway from me. What kind of technology were they involved with? I didn’t know which Cannon it was. Google showed me several different companies called Cannon. Many of them turned out to be civil engineering companies. They talk about themselves in similar language. Each of them expect that you already know everything about Cannon. Therefore, they don’t feel it is necessary for them to explain what they do. They’re only interested in talking to industry insiders who already know Cannon’s capabilities. Which one was it? Was it the Cannon that showed people climbing a mountain on their home page? One thing the two Cannons have in common is that neither of them cares to go into any detail to explain what it is that they do. “Dedicated industrial solutions” for one of them, “Reliable responsive solutions” for the other. Instead, each of them tell you their opinion of themselves using abstract language that ranks very low on the Readability Index. They don’t care if you read it or not. So they wouldn’t be interested in my services as a technical copywriter. The CraigsList ad said that what they were looking for was a proposal writer skilled in compliance, and able to deliver a “report-like document.” I don’t know what a “report-like document is. Perhaps it is an industry term. Smaller companies look at sites like this and think this is how big companies do it, so they try to emulate the pedantic tone of abstract principles. My theory for smaller companies is that, since nobody knows anything about you, you might as well start with a clear plain explanation of what you offer to the world. By converting your technical information into a clear plain explanation, I can display your competitive advantages to a wider audience. TorrLube’s home page gives you only aspirational generalities about tribology. Click picture for larger version. How to break out of the center-of-the-world complex. If you’re trying to expand your customer base, you have to be specific about what you are offering. 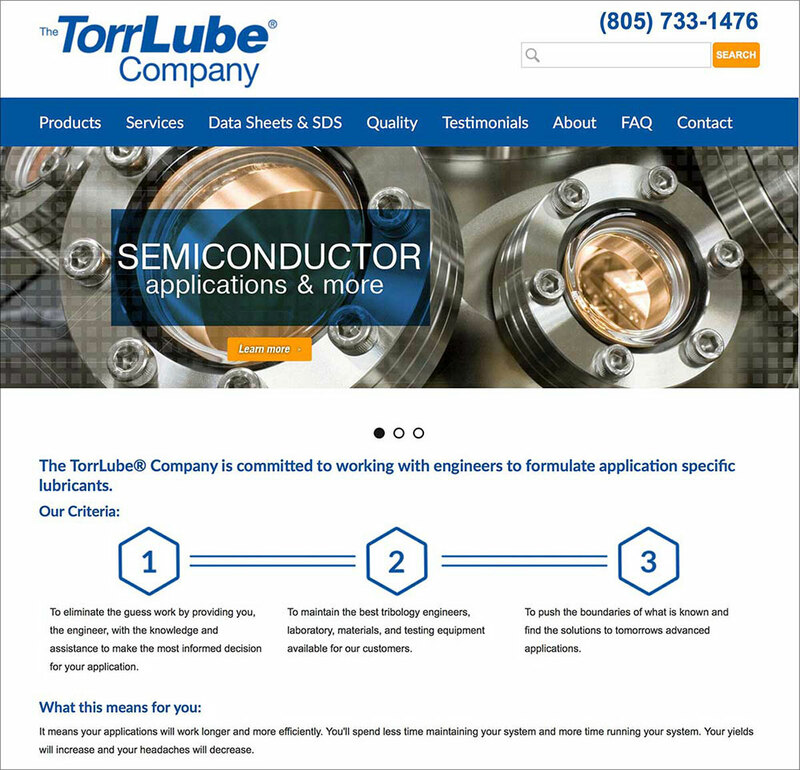 Here’s what I did for TorrLube, a small company that for fifteen years has been selling a specialty lubricant called PFPE to the semiconductor industry for $5,000 a pint. You can buy PFPE from the competition for $400 a pint. How does TorrLube command such a premium price? You can’t find out from their home page. All they tell you is that they’re committed to working with engineers; they eliminate guesswork, they push the boundaries of what is known. Your headaches will decrease. 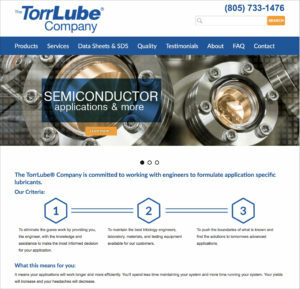 Their existing customers in the semiconductor industry already realize how much better TorrLube is than the competition. It goes without saying. I condensed TorrLube’s story into a 260-word elevator pitch. Click to see full-size page. They told me they wanted to expand into the aerospace industry. I created a clear plain explanation for them. 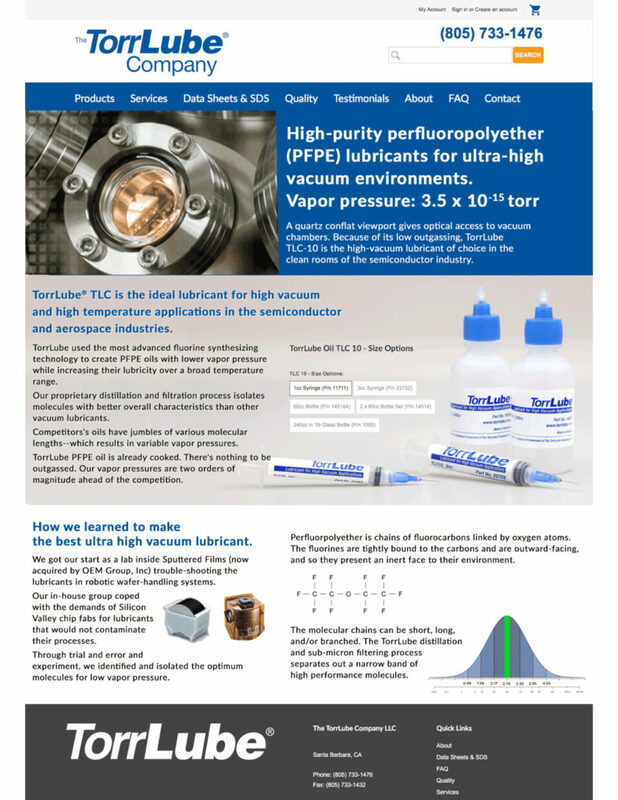 It was fun to learn about ultra-high-vacuum lubrication. Like a lot of tech companies, TorrLube was blasé about their own accomplishments because they were so familiar with their own esoterics. Their target audience was tribology engineers. There was no need to explain anything to their fellow engineers. Part of the invisibility of TorrLube’s site is that they bill themselves as “unparalleled.” This may be true. But it doesn’t tell anybody anything. We don’t know what parallels are being talked about. The text gives us no foundation of knowledge to stand on. So I created a clear plain explanation for them. I studied their information and interviewed the owner and the upper echelon of TorrLube staff to get more information. I studied their foremost competitors. I saw that every other manufacturer was selling their product as a commodity. You want PFPE? Click here to buy. Then, I presented a draft of information and re-interviewed the TorrLube engineers, now that I had a glimmer of what they were doing. They corrected my mistakes and pointed out new things they hadn’t thought of mentioning before. I pushed for more explanations of their technology. I told them that my plan was to write about their technology until I got it right, with them correcting me along the way. Eventually I condensed it into 260 words and a couple of pictures. I specialize in finding out what is interesting about you. Technical companies don’t need copywriting flimflam to sell their products. They need clear, rational explanations, not verbal cosmetics. Forcing their unique achievements into the straightjacket of buzzwords won’t help. I present the facts in a sequential manner. When I begin a job for you, I am a person encountering your company for the first time, and I create a presentation that will demonstrate what I learn about you. I aim the text at people who might not already know everything about you. I am very impressed with the draft you created. I think you did a great job highlighting the differences between TorrLube and the competition. The copy is really good. I also like how you touched on TorrLube history with Sputtered Films and I think you did a fantastic job illustrating how the distillation process separates out the narrow band of high performance molecules. Overall, I think the page looks great. Very well done!